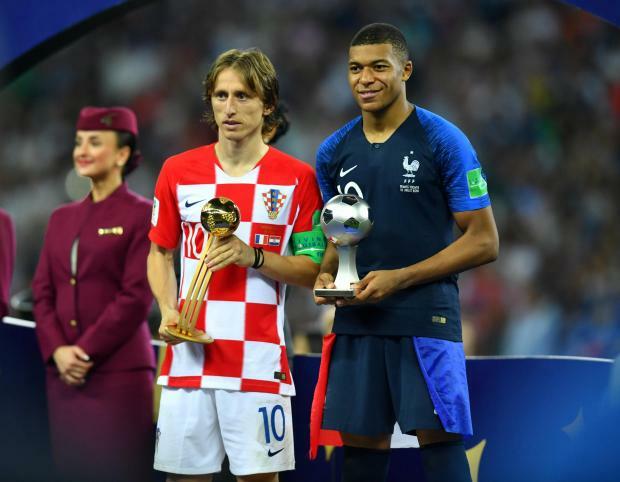 Croatia's Luka Modric poses with the World Cup Best Player Award as France's Kylian Mbappe poses with the World Cup Best Young Player Award. Luka Modric was unable to guide Croatia to World Cup final glory but won the Golden Ball award after being voted the tournament's best player. The 32-year-old and his team-mates finished on the wrong end of a 4-2 scoreline at Moscow's Luzhniki Stadium on Sunday as France collected the trophy for the second time after an eventful game. But the Real Madrid schemer's performances in the competition, which saw Croatia make the final for the first time in their short history, were recognised by FIFA's technical study group, a committee comprising former Brazil coach Carlos Alberto Parreira, Nigeria's Emmanuel Amunike, Serbia's Bora Milutinovic, ex-Scotland manager Andy Roxburgh and former Holland star Marco van Basten. Modric beat off competition from Belgium playmaker Eden Hazard, who was awarded the Silver Ball and Bronze Ball winner Antoine Griezmann, the France forward who also finished second behind England's Harry Kane in the Golden Boot stakes. Modric scored from a penalty against Nigeria and with a superb strike in a 3-0 win over Argentina in the group stage, and although he missed an extra-time spot-kick against Denmark in the last 16, he was successful in the shoot-out and repeated the feat against hosts Russia in the quarter-finals. Griezmann's 19-year-old team-mate Kylian Mbappe will return home with the Young Player award as well as his winner's medal after also finishing the competition with four goals, the last of them France's fourth in the final. Belgium keeper Thibaut Courtois claimed the Golden Glove with a string of fine individual performances as Belgium finished third. Courtois kept three clean sheets - two of them against England - and conceded only six goals in his seven games. Spain exited the competition in the last 16 when they went out on penalties to Russia, but picked up the Fair Play award having collected just two yellow cards and committed 34 fouls in their four games.